(c.1353–c.1428) A close companion to Wycliffe, Purvey was his personal secretary, fellow lodger in the rectory, curate at Lutterworth, assistant in his literary labors, and Wycliffe’s constant attendant till the end. Wycliffe, a prolific writer, undoubtedly dictated much of his work to Purvey. He knew the mind of the master. Thus, after Wycliffe’s death, Purvey did much to interpret and popularize Wycliffe’s writings and doctrines. Purvey is considered a major contributor to the translation of the Bible into English, especially the revision which generally bears his name, a revision of the Wycliffe Bible completed in 1388. Purvey was also a preacher, whose sermons disturbed church leaders. In 1390, he was imprisoned. 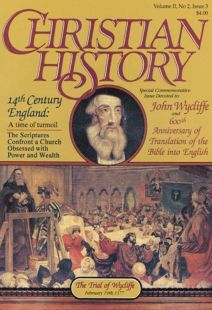 While there, he wrote a commentary on the Apocalypse based on lectures primarily delivered by Wycliffe. In 1401, three days after the first Wycliffe martyr was burned at the stake, Purvey recanted. He was released and given a vicarage. But his conscience soon forced him to resign from receiving such revenue from the church and he disappeared. In 1421 he was again imprisoned for preaching. Nothing more was heard of him. (1340–1399) This English prince was Wycliffe’s patron and protector, and England’s most powerful political figure in the late 14th Century. Gaunt, better known in his day as the Duke of Lancaster, was virtually the ruler of England during the last years of the 50-year reign of his then senile father, King Edward III, and during the first years of the reign of his adolescent nephew, Richard II. Gaunt was very wealthy, a wise diplomat, a bold but not always able soldier, the epitome of chivalry, hard on his enemies, always faithful to what he thought was best for England, and ambitious. He attracted the ablest men of his day within his circle. In such a situation, he inspired both admiration and distrust, loyalty and opposition. His death in 1399 led to the overthrow of King Richard II by Gaunt’s son, who ascended the throne as King Henry IV, the first of three 15th Century Lancastrian monarchs directly descended from John of Gaunt. (c. 1342– 1396) As Archbishop of Canterbury (1381–1396), he was the most formidable opponent of Wycliffe. Although Courtenay failed to convict Wycliffe in several trials, Courtenay was eventually effective in having Wycliffe banished from Oxford to Lutterworth. Because of Courtenay’s royal blood, his effective administrative ability, and his strong support of papal authority, he was a powerful influence in the politics and the church life of England. His rise was fast. At 25 he was Chancellor of Oxford. At 33 he was the influential Bishop of London, where his opposition to John of Gaunt brought him power and popularity. He was not a great scholar, but a practical thinker. In each public encounter with Wycliffe Courtenay must have recognized the superiority of his opponent’s ability to reason, to persuade, and to remain true to his faith. But Courtenay was determined to attack the heresy of Wycliffe, so he struck at the leaders of Lollardy in Oxford and left the master unmolested at Lutterworth. Courtenay’s unrelenting persecution of Lollardy continued after Wycliffe’s death. (died c.1420) Hereford was one of Wyliffe’s most learned Oxford colleagues and followers. A Doctor of Divinity, Hereford stood by Wycliffe in his public trials. From 1380, he worked with Wycliffe and John Purvey in translating the Latin version of the Bible into English. His own translations were very literal and awkward reading. An inflammatory sermon preached by Hereford on Ascension Day at Oxford in 1382, inciting people to Wycliffe’s defense, got him and other Lollard leaders excommunicated. He went to Rome to appeal personally to Pope Urban VI. He was imprisoned. In June 1385, a popular uprising in Rome freed many prisoners, including Hereford. He remained underground until 1387 when he resumed his Lollard life in England and was arrested. He was “grievously tormented.” Finally, in 1391, he recanted. In return, he gained influential patronage. In 1394, he was promoted to chancellor of Hereford Cathedral. But in 1417, he renounced all benefices and doles to retire in old age to the Carthusian monastery of St. Anne in Coventry. (1329–1378) This was the Pope who issued five scathing bulls against Wycliffe in May 1377. This was the Pope who ended “The Babylonian Captivity” by moving the papal court back to Rome after 67 years of “exile” in Avignon, France. This was the Pope whose death brought on “The Great Schism” lasting 39 years. His career was amazing in itself. The young French churchman was a canon at eleven and a cardinal at nineteen. He was the nephew of Pope Clement VI. In 1370 he was unanimously elected Pope at the age of 41. Gregory tried to make peace between England and France. He fought against the warring Florence, allied with other rebellious papal cities. He hoped returning the papal court to Rome would bring peace. It did not. Upon his death in March 1378, the church split on his successor-Pope Urban VI in Rome and Pope Clement VII (the “anti-pope”) in Avignon. Not until the Council of Constance in 1417 was the schism healed. (c. 1340–1400) The famous poet was a few years younger than Wycliffe. Both benefitted from the life-long patronage and protection of the powerful John of Gaunt. Both were critical of the excesses of the church of that day—Chaucer by poetic wit and Wycliffe by prose reasoning. Both wrote in the Midland English dialect and their writings later influenced the shaping of the modern English language. Neither specifically mentions the other in their respective writings. Yet it is hard to imagine that the two were not acquainted. In fact, tradition says that Chaucer in the Canterbury Tales based his characterization of “The Parson” on the rector of Lutterworth. For thirty years Chaucer served his country on diplomatic missions to Flanders, France and Italy and in various domestic positions as a civil servant He was thoroughly knowledgeable about the life of his time, as he so vividly portrays in his writings. He was buried at Westminster Abbey, a high honor for a commoner. The Queen Mother at the time of Wycliffe’s Lambeth trial in 1378 was Joan of Kent, the widow of the legendary warrior-hero, Edward the Black Prince. She interceded on behalf of Wycliffe at that trial. As a staunch protrectress of Wycliffe and the “New Learning”, she was persistent and her court, emissary, Sir Lewis Clifford, spoke with authority. As a result, no judgment was made by the bishops against Wycliffe. The Queen Mother shared many of her husband’s concerns, including his dislike for churchmen not willing to pay for the war. Her household was known to have entertained more than one knight who was friendly with “heretics.” Four of the executors of her will were suspected of Lollardy, even Sir Lewis Clifford himself. (1366–1394) Queen Anne provided a noteworthy link to the spread of Wycliffe’s teachings. She was praised for her reading of “godly books,” her possession of the Scriptures in three languages, and her “constant study of the four Gospels in English.” Princess Anne was 16 when she married King Richard II in 1382. He was 15. She was probably one of the better influences on his life over their next twelve years together. Their marriage had been arranged by diplomats. Anne’s father was Emperor Charles IV of the Holy Roman Empire and her brother was King Wenceslaus of Bohemia. The traditional alliance between Bohemia and France had been shattered by their joint defeat by the English at the Battle of Crecy and by the Schism in Christendom. The French supported Pope Clement VII in Avignon and the English, Pope Urban VI in Rome. Pope Urban VI persuaded Wenceslaus to ally with the faithful English. Thus, Anne became Richard’s Queen. At the encouragement of Queen Anne, Bohemian students came to Oxford. Many carried back to Prague the writings and teachings of Wycliffe. Within years the seed ripened into the Hussite movement in Bohemia. Probably inspired by St. Francis and his street evangelists or by Luke 10:1–4, Wycliffe sent out from Oxford his order of “poor priests” or “itinerant preachers,” who traveled the countryside, lived and dressed simply, and preached wherever people would listen. As early as 1377, they were denouncing the abuses of the church, proclaiming the rediscovered understanding of the doctrine of the Eucharist, and teaching biblical thinking from which would come right living. Many were graduates or undergraduates, probably faithful students or colleagues of Wycliffe. Most were ordained, but not tied to a parish, free to travel. Later Wycliffe employed committed laymen. He defended their right to preach as long as they had accepted the divine call. He called them “evangelical men” or “apostolic men.” It was for these “poor preachers”—both lay and ordained—that Wycliffe prepared his tracts, his skeletons of sermons, and his paraphrases of the Bible—all in the English dialect of the people. Pope Gregory XI condemned Wycliffe five times.